The rent at San Regis Apartments ranges from $1,799 for a one bedroom to a $2,107 two bedroom. Apartments in this building are about 1% more expensive than the Van Nuys average. This is a pet-friendly apartment. This apartment is in the Van Nuys neighborhood in Los Angeles. Nearby parks include Blythe Street Park, Delano Park and Van Nuys Recreation Area. San Regis Apartments has a Walk Score of 73 out of 100. This location is Very Walkable so most errands can be accomplished on foot. 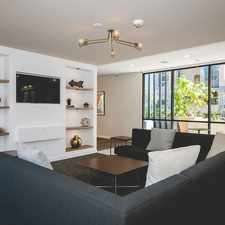 Providing unmatched comfort, convenience, and style, San Regis is Van Nuys' most extraordinary address.The newly restyled apartment home interiors at San Regis feature dual-tone paint, ceiling fan, updated baths, upgraded kitchens, new flooring and more. You can work out in our fitness studio, swim laps in the huge resort style pool, or enjoy an energizing game of tennis on our sport courts every day. For something less strenuous, try the soothing spa or check your email in our business center. We are a pet-friendly apartment community so your four-legged friend will enjoy those long walks by your side. Cut your commute down to something reasonable with easy access to both the 405 and 101 freeways along with endless ways to navigate the many very beautiful San Fernando Valley residential neighborhoods. Your new home will be conveniently located close to the Van Nuys and Burbank Airports, California State University Northridge, Sherman Oaks Galleria, Northridge Mall, Universal Studios, Universal City Walk, Hollywood Bowl, and Magic Mountain. Outdoor enthusiasts will enjoy our proximity to the really spectacular Lake Balboa and Sepulveda Dam recreational areas. Also a short drive away is the Balboa Sports Center and several world class golf courses. Explore how far you can travel by car, bus, bike and foot from San Regis Apartments. San Regis Apartments has some transit which means a few nearby public transportation options. Car sharing is available from RelayRides. View all Van Nuys apartments on a map. San Regis Apartments is in the Van Nuys neighborhood. Van Nuys is the 42nd most walkable neighborhood in Los Angeles with a neighborhood Walk Score of 70.